And then Gandhi came, He did not descend from the top: he seemed to emerge from the millions of India, speaking their language and incessantly drawing attention to them and their appalling condition. Get off the backs of these peasants and workers, he told us, all you who live by their exploitation; get rid of the system that produces this poverty and misery. Political freedom took new shape then and that produces this poverty and misery. Political freedom took new shape then and acquired a new content. Much that he said we only partially accepted or some times did not accept at all. But all this was secondary. The essence of his teaching was fearlessness and truth and action allied to these, always keeping the welfare of the masses in view. The greatest gift for an individual or a nation, so we had been told in our ancient books, was abhaya, fearlessness, not merely bodily courage but the absence of fear from the mind. Janaka and Yajnavalkya had said, at the dawn of our history, that it was the function of the leaders of a people to make them fearless. 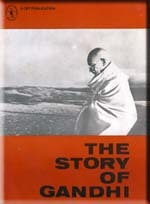 But the dominant impulse in India under British rule was that of fear, pervasive, oppressing, strangling fear; fear of the army, the police, the widespread secret service; fear of the official class; fear of the laws meant to suppress and of prison; fear of the landlord's agent; fear of the money lender; fear of unemployment and starvation, which were always on the threshold. 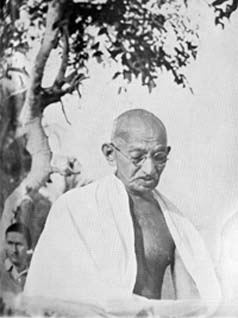 It was against this all-pervading fear that Gandhi's quite and determined voice was raised; be not afraid. Was it so simple as all that? Not quite. And yet fear builds its phantoms which are more fearsome than reality itself, and reality, when calmly analysed and its consequences willingly accepted, loses much of its terror. So, suddenly as at were, that black pall of fear was lifted from the people's shoulders, not wholly of course, but to an amazing degree.